In 1943, five years before Israel became a nation, the state of Alabama passed a resolution unanimously calling for the creation of the state of Israel. Alabama led the Nation in supporting Israel back then and they are doing it again now in 2002. On April 4th 2002 the Alabama Governor signed Resolution 85 (enrolled as Act 2002-258), which passed UNANIMOUSLY in both the Alabama state House and Senate. This resolution was modeled after the 1943 resolution and calls for the unequivocal support of the state of Israel. It also includes Alabama governor Don Siegelman's "Good Friday and Passover Proclamation Day of Remembrance" on March 29th 2002 in response to the "Passover Massacre" that killed 28 people in Israel this Passover 2002. My friend Robert Somerville and I attended an "Israel Now" rally in Birmingham on Tuesday April 23 2002 which celebrated this proclamation that the state of Alabama is making and sending to Washington. About 2,000 Jews and Christians attended this event which was sponsored by the Birmingham Jewish Federation, and was held at Samford University which is a Christian campus in Birmingham Alabama.29 When we as Christians begin to understand our role as "protector and friend" of Israel (Isa. 40:1-2), then Messiah will be revealed to the Jew through our actions and our love. God is love, and the Jew provides the "acid test" to see if we are living the real gospel or if we are just playing church games. It may be easy to write off this event as just another solidarity gathering, but we must understand the times and seasons in which we live. I believe that this natural coming together of Jew and Christian is preparation for the spiritual "grafting in" where the Israeli nation receives their Messiah: "For if the Jew's being cast away is the reconciling of the world (saving of the Gentile nations), what will their acceptance (of Messiah) be but life from the dead?" (Rom 11:15). Paul called it a "mystery" (Eph. 3:3) and says that God has created "one new man" (Eph. 2:15) from both the Jew and Gentile. Alabama is participating in the "wisdom of the ages" as the "Heart of Dixie," which was birthed out of the civil war rebellion, is being redeemed to become the "Heart of the Father" bringing forth true unity in Christ. 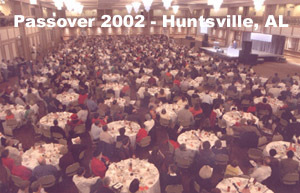 Another recent example of true unity on a regional basis occurred in my hometown of Huntsville Alabama on March 26th 2002 when many Christians of different fellowships in this area gathered at the "Christ our Passover Unity Banquet. "30 This was the largest trans-denominational Passover event ever held with over 1,200 Christians gathered under the banner "Let there be no strife... for we are brethren" (Gen 13:8). The focus of the gathering was the body and blood of Jesus because this is what Passover is all about. It was at the last supper when the Lord told His disciples, "By this shall all men know that you are my disciples, by the love you have one to another" (John 13:35). This event was not a false unity based on setting aside our differences, but it was based on our agreement that the blood of Jesus is our ONLY access to the Father. Why should Christians bless Israel? - This is an important question to answer because it is obvious that many of the actions of the modern day nation of Israel do not represent the character of Yahoshua (Jesus). However, Israel DOES have a prophetic role based on the Covenants that God has made with Israel's forefathers and our spiritual fathers. The "Kingdom of God" was indeed taken from national Israel when their nation rejected the Messiah Yahoshua (Jesus) and it was given to the Gentiles who believed. However, Israel's standing as a chosen nation "for the sake of the fathers" (Romans 11:28, 15:8) is still in progress now at the end of the age. This is because God's Covenants are irrevocable. Technically, the Kingdom of God does not have a certain ethnic makeup of either Jew or Gentile because God does not see race. He does, however, recognize and deal with nations. So, while there has always been a small remnant of Jews who do believe in their Messiah, the Israeli nation as a whole rejected Jesus. Therefore, generally speaking, the "Kingdom" was taken from national Israel. However, their identity of "Israel" (where Israel is defined as people who are the natural offspring of Jacob) has not been taken away. The important thing that we are "blessing" in the nation of Israel is God's Covenant promises with our spiritual forefathers, and not necessarily every decision that the modern day nation of Israel makes. This is especially important now, because the times of the Gentiles having the corner on the Kingdom of God are coming to an end. God has indeed extended a time of favor on the Gentiles for the past 2,000 years, and simultaneously a time of chastening on the Jewish people as they have been scattered all over the earth. But now the roles are being reversed. We are entering into a time of favor upon the Jewish people as many of them are receiving their Messiah. At the same time, the Gentile nations are now entering into a time of judgment based on how they have treated Israel. Ultimately, those nations who come against Israel will suffer greatly. Many of Israel's prophets saw this time of judgment on the nations saying, "it is the day of the Lord's vengeance, the year of recompense for the controversy of Zion" (Isaiah 34:8). According to Joel 3:1-2, God will enter into judgment on the nations in the Valley of Jehoshaphat because "they have divided up My land." This Valley just happens to be in East Jerusalem, which the modern day Palestinians claim as theirs, and the United Nations plans to divide. The Jewish people have paid the price of being a "chosen" nation as they have been some of the most persecuted people through the ages. The greatest modern day geo-political miracle is the re-gathering of the Jewish nation, and the greatest spiritual miracle will be when the nation of Israel accepts Yahoshua (Jesus) as her Messiah. Our prayer should be that the Jewish people and the nation of Israel would be grafted back into their original "Kingdom" by accepting their Messiah Yahoshua! Jesus told Nicodemus, "unless one is born again, he cannot see the kingdom of God" (John 3:3). Whether we are a Jew or a Gentile (which includes all other nationalities), there is no other name given under heaven by which men can be saved except the name of Jesus. We should bless the Jews because their fathers represent our spiritual heritage through whom Jesus came. Jesus is everything, and all believing Jews and Gentiles will be combined in Him (Messiah Yahoshua) who is God in the flesh.